There are some food discoveries that feel like breaking into the vault, and there are others that feel like finding cash on the ground. Those in the latter category are so straightforward, so obvious, so unfair even, that you're left only to wonder why the rest of us aren't doing this—or rather, eating like this—all the time. Chimaek is one such discovery. The word is a mash-up of fried chicken (chi) and beer (maekju), a combination that's been a staple of Korean dining for years. Now, this might not seem on par with the invention of kimchi, or say, the light bulb. It's not even an invention, really. 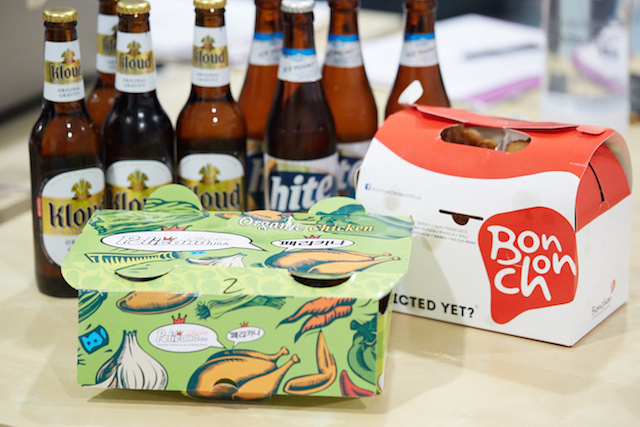 "I've had fried chicken and beer before," you're saying. "What so special here?" But Koreans, in a true collective stroke of genius, built an entire business model around this pairing. They made it one thing. Chimaek started in the 1970s, and fried chicken has remained the anjoo of choice ever since. ("Anjoo" refers to any food that pairs well with an alcoholic beverage.) "Peak Chimaek" hit during the 2002 Korea-Japan World Cup, when it seemed as though the entire nation packed into bars to watch TV and eat fried chicken. Is there any better way to enhance the visceral connection to a sporting event than by eating with your hands and sipping on a beer? Currently, there are more than 36,000 fried chicken places in South Korea. It's common to use the whole bird for frying, as opposed to picking and choosing the number of wings, thighs, etc. The chicken is typically double fried and covered in a thick, tangy sauce. As far as the beer goes, the theme is light and watery, as Korea hasn't had much of a beer culture until very recently. But the beer isn't meant to be a flavor vehicle anyway. It's a cold, carbonated rush to complement the spicy, salty, oily chicken. Water isn't tough enough. A strong IPA or Porter would ruin the palate. Light, watery beer is the way. You can dine-in for chimaek (moving from place to place with a group of friends is common), but it's also a major part of Korea's notoriously tenacious delivery system. You can get chimaek delivered to your apartment, or you can get it delivered to a mountain for a picnic. The normal delivery obstacles in an American city (a fifth floor walk-up! a missing doorbell!) don't really exist. The fried chicken and beer will get there, somehow. This system adds another layer of "flavor" to chimaek: The people want fried chicken and beer, and they want it now, please. 1. A late night snack craving. 4. A Korean drama marathon. 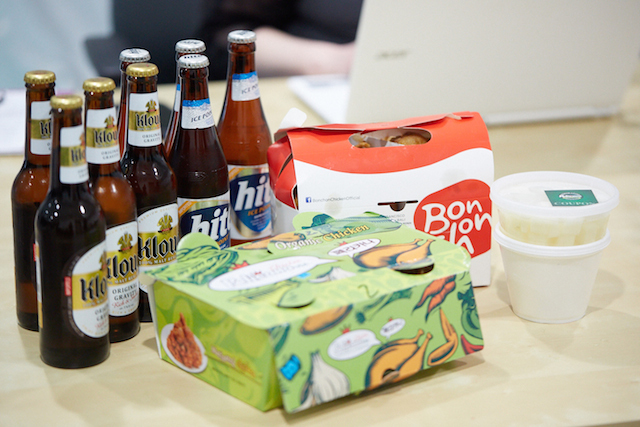 We ordered from two different places—Pelicana Chicken and Bon Chon—in four different styles. From Pelicana, we got the regular (which has the default tangy, thick sauce), and the sauceless (though a wave of disappointment flooded the office as they forgot the scallions on top). From Bon Chon, we went with soy garlic and hot and spicy. Feelings were mixed among our small but selective group of eaters. One felt the sauce on the Pelicana regular was not nearly thick and spicy enough, while another felt that the Bon Chon had an unexpected lightness. The most noticeable things for me were the lack of grease and impressive crispiness even after a car ride and a series of Instagram photos, the two most common causes of death in fried chicken. I also really enjoyed that Pelicana makes use of the whole chicken. One can't live on wings alone. While we were eating, I was thinking of all the artisanal trends that could disrupt this perfect waltz of a dish. It's too easy to dream up a local hand-crafted beer (it's in the batter, too, of course!) next to chicken that's been fried in sunflower oil and topped with a doughnut—all served in a pastel-colored mason jar. Tune it all out. 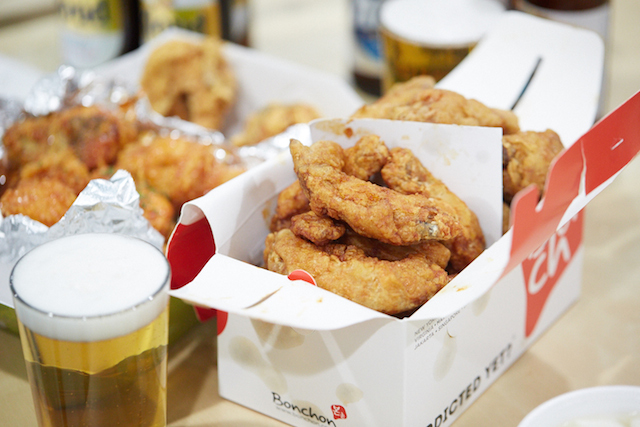 Light, watery beer and spicy, fried chicken. Don't fight it. One last thing: There must always be a side of pickled radish. In Korea, the meal is considered incomplete without it. That's another thing to love about chimaek—it is a refined indulgence.